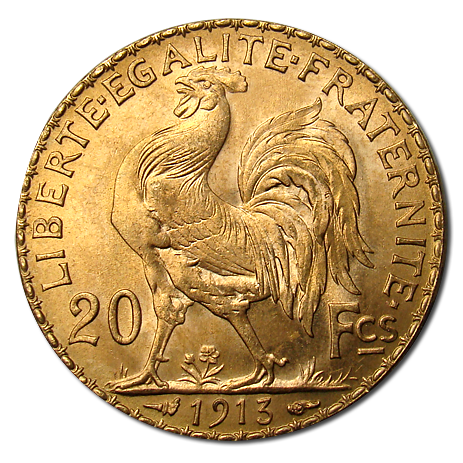 Always popular among gold investors and collectors alike, the French 20 Franc Gold Coins are highly recommended for their consistent Gold content, historic designs, and older coin dates. Minted from 1898 to 1914, these were French Gold Coins, real money issued by France. From 1907 to 1914, some dates were officially re-struck at the Paris Mint in 1921. 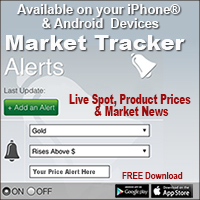 Guaranteed to contain .1867 troy ounces of pure gold, that’s about 1/5th of a troy ounce. Face value is 20 francs as stated on each coin. The time honored design is the head of the “Third French Republic”established after Napoleon’s defeat in the Franco-Prussian War of 1870. The reverse design is a French Rooster (like we use an eagle symbol) and this side bears the date, Liberte, Egalite, and Fraternite– words popularized during the French revolution against Louis XVI. Many people hoard away 50 or 100 of these are ideally sized “emergency” Gold Coins. As Gold prices rise, it’s hard to make change for a $1200+ Gold Coin. A 1/5 of an ounce coin is excellent alternative. 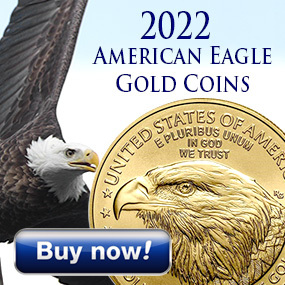 We highly recommend you order at least one of the French 20 Francs and consider also similar historic Gold Coins like the Swiss 20 Francs and the British Sovereigns just for the pleasure of seeing these beautiful, historic world coins.